Whenever my little guy feels crafty, we open up my big drawer full of supplies and look for inspiration. Yesterday, I spotted some make-a-face stickers that we had left over from a book. Instead of smacking them on paper, I saw a big bunch of bananas and let him bring our bananas to life. Here's a look at our stickers (above). I don't remember which book they came from, but I found some inexpensive make-a-face-stickers from Oriental Trading that you can buy online. Even if this particular project isn't your cup of tea, make-a-face stickers can be used for so many different crafts, that it's a good staple to have in your craft supply stash. 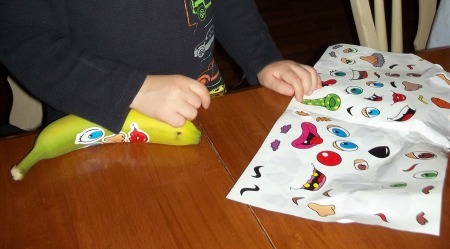 My son had fun choosing his stickers and designing the banana face. What would you think if you walked into someone's house and saw these sitting on their kitchen table? I think they're pretty funny. This activity was easy, kept my son busy for a while and was completely mess free! 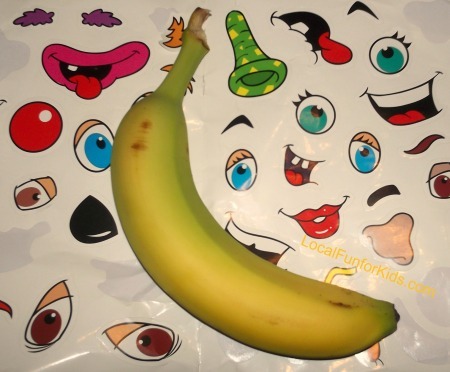 You could easily turn this craft into a Valentine treat by adding "I'm going bananas over you!" stickers as shown here on Twig and Thistle, or the "I'm bananas for you" bag topper by Peonies and Poppyseeds.